The figure of a building with four pillars represents the core organization of the book. This book begins by orienting you to the foundational dispositions and skillsneeded to support your blended teaching practice. 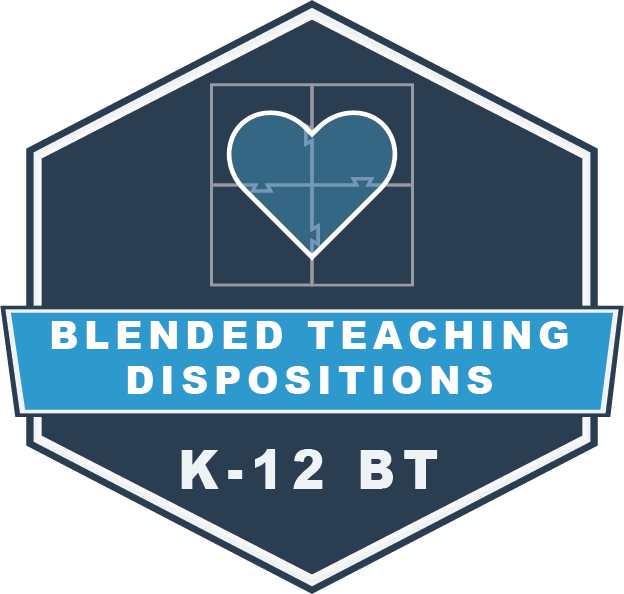 Then you will be introduced to four key competencies for blended teaching represented by the pillars of (1) online integration, (2) data practices, (3) personalization, and (4) online interaction.The final chapter helps you bring all four competencies together as you implement blended teaching in your classroom. The chapters around these four pillars do not have to be read in order, though we have put them in the order that we think makes the most logical sense. Definitions for words or phrases that are highlighted in blue can be found in the Glossary before the Appendices. Appendices contain additional source and resource information as well as examples of completed Blended Teaching Roadmaps for elementary and secondary school contexts. Finally, the icons found throughout the book will direct you to external features, in-chapter challenges, and badging features that will help your learning. Readiness Survey - Each chapter begins with a link to a brief readiness self-assessment survey. The survey should take you 2-3 minutes. It will provide you with a sense of your current aptitude for blended teaching specific to each competency. Video Examples - There are also videos throughout the book that will help you see specific examples of the skills taught in the chapter in practice. Web Resources - External web resources are provided as helpful illustrative guides that will enhance your understanding of the skills taught in each chapter. Feedback - Each chapter has a link where you can share your feedback, ideas, and experiences with blended teaching. Your input can help us to improve this resource for other teachers. Review - At the end of each chapter you will find a review challenge. This challenge will help you check your understanding of the main concepts within the chapter. Plan – Also included are practical planning prompts. These are intended to help you plan lessons and activities that utilize the knowledge and skills addressed in the chapter. Build – In addition, each chapter has a few real-world challenges that will help you create an activity and/or assessment that can be used in a blended lesson. Go for the Badge! - This feature provides you with the opportunity to put what you learn from reading this book into practice. At the end of each chapter, there is a link to a Chapter Roadmap that will lead you through applying the strategies and ideas from the chapter to your own classroom practices. To access the Roadmap, following the link to the Google Doc at the end of each chapter, and then click File > Make a copy. This will allow you to edit your own digital copy of the Roadmap. There are also examples of completed Roadmaps in Appendix C.
At this time the six Blended Teaching Badges are not fully available. However, working through the Roadmap will help you to see the evidence of blended practice they will likely require.